“This law honors our lesbian, gay, bisexual and transgender brothers and sisters whose lives were cut short because of hate,” said Human Rights Campaign President Joe Solmonese. Washington, D.C.–(ENEWSPF)– The Human Rights Campaign, the nation’s largest lesbian, gay, bisexual and transgender (LGBT) civil rights organization, praised President Barack Obama today for signing the Matthew Shepard and James Byrd, Jr. 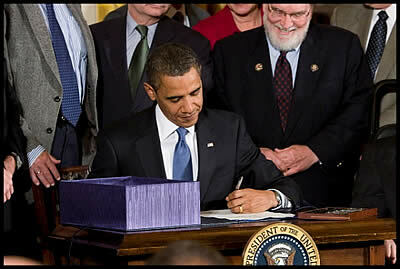 Hate Crimes Prevention Act into law. The new law gives the Justice Department the power to investigate and prosecute bias-motivated violence where the perpetrator has selected the victim because of the person’s actual or perceived race, color, religion, national origin, gender, sexual orientation, gender identity or disability. The legislation was added as a provision to the FY 2010 National Defense Authorization Act earlier this Summer. For a comprehensive retrospective and historical overview of hate crimes advocacy visit: www.hrc.org/loveconquershate. “We applaud President Obama for signing this bill into law and thank the leadership and our allies in the House and Senate. We also will always remember the tireless efforts of Senator Edward Kennedy on this issue. Senator Kennedy once said that this legislation sends ‘a message about freedom and equality that will resonate around the world.’ This marks the first time that we as a nation have explicitly protected the LGBT community in the law. And this law sends a loud message that perpetrators of hate violence against anyone will be brought to justice,” said Solmonese. The Matthew Shepard and James Byrd, Jr. Hate Crimes Prevention Act honors the memory of Matthew Shepard, a Wyoming college student brutally murdered in an act of hate violence in 1998, and James Byrd, an African-American man who was dragged to death in Jasper, Texas, in 1998. The new law also provides the Justice Department with the ability to aid state and local jurisdictions either by lending assistance or, where local authorities are unwilling or unable, by taking the lead in investigations and prosecutions of violent crime resulting in death or serious bodily injury that were motivated by bias. It also makes grants available to state and local communities to combat violent crimes committed by juveniles, train law enforcement officers, or to assist in state and local investigations and prosecutions of bias motivated crimes. This legislation was first introduced in the 105th Congress. There have been 14 total votes in the U.S. House and U.S. Senate to bring this historic legislation to the president’s desk.